When I was a kid, I thought buttercups were so beautiful. They still are if you get close enough. I have this horrible, reoccurring dream every couple of months and it happened again last night. In my dream I start losing my teeth one by one. Well, losing is probably not the right term; more like I push my teeth out with my tongue and can’t stop myself, some kind of irresistible, self-destructive urge that makes me panic in my sleep. It’s a really stressful dream and every time I wake up from it takes me a few minutes to realize I actually still have teeth, which always results in a feeling of complete and utter exhilaration, as if I’ve somehow beaten fate. I have accepted that I’m short and chubby with tiny duck-like feet, but I think being short and chubby with duck-like feet AND no teeth would be more than I could bear. Anyway, the point of this little story is this: A few months ago, I joined a writer’s meetup called “Monkey’s with Typewriters” but I’ve yet to go. I love researching, I love writing and I love creating; in my ideal world I’d spend all day writing in my historic farmhouse situated on a bucolic piece of land with picturesque undulating hills and white picket fences. Except that I don’t spend my days writing (unless you count blogging) and don’t have enough money for a shared apartment, much less a farmhouse, so I’m not exactly working too hard to make my dream happen. And it struck me this morning that maybe my dream means I need to be a little more proactive and make things happen. So tonight I’m going to my first writing meeting in the hopes that being surrounded by other people who like to think of themselves as writers will inspire me to write. After my post-dream despair dissipated, it dawned on me today that in all likelihood, I am currently going through the last low stress period in my life, at least until I retire. (Let’s put the teeth dreams, no money in the bank, no work-related benefits thing on the side because I’m a glass half-full kind of person). As I mentioned in my post about half days, I work a 30-hour a week job that I enjoy and that also allows me plenty of time for things I enjoy outside of work. I took a semester off grad school and still have 2.5 carefree months before I start taking classes again. I knit, I was HBO Go, I take long hikes on the weekends, I spoil my dog, go to happy hour, Skype for hours, walk everyday and enjoy life. And yes, I do live with my parents in my childhood room but I couldn’t ask for a better rent deal: All utilities and meals included, my own personal bathroom and quiet “roommates.” Sure, they’re in their fifties and related to me but when you’re living rent free, you tend to be more flexible. Creek at Four Mile Run. 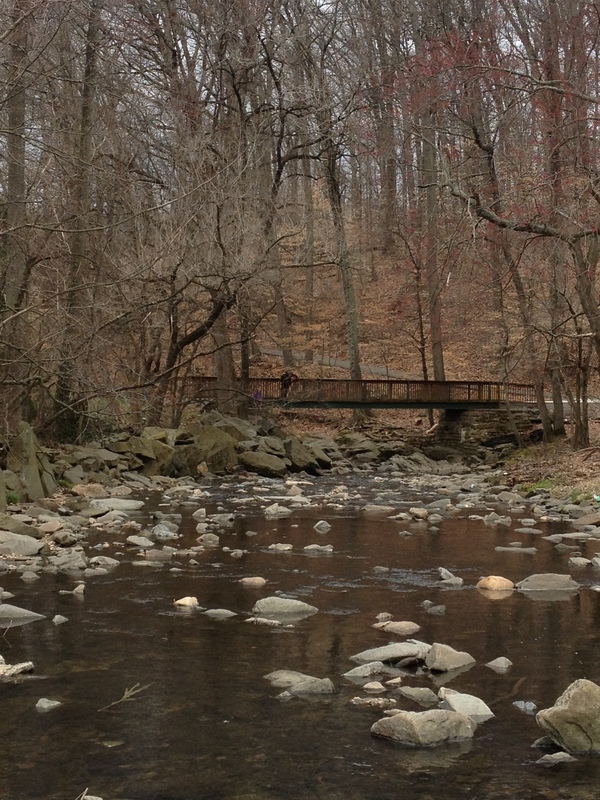 Anyway, today was a beautiful, crystal clear, 52-degree day (perfect weather for a quick walk) and when I got off at 2 I drove down to Glencarlyn Park, this beautiful, regal park on the border of Arlington and Falls Church. I took a few pictures of the small picnic area and then caught Four Mile Run and walked along the stream for a couple of miles, happily taking pictures of buttercups, tiny waterfalls, cool-looking rocks and mossy trees. I saw brown birds, blue birds, red birds, gray birds and black birds, squirrels and tadpoles, enjoyed the sound of water making its way over rocks and stones and felt a little nostalgic when I saw families picnicking together, like my family used to back in the eighties and early nineties. It would be so nice if you could time travel once in a while to those uncorrupted, happy childhood memories back when you thought your parents were perfect and everything looked so big and impressive. Why is it time can only move forward and not backward? You’d think they’d have invented something to fix that by now.But back to my walk: I had planned to go further but was suddenly struck by an unstoppable, all-encompassing craving for Chipotle, so I headed back to my car and looked for the nearest Chipotle in my GPS. I still can’t believe I got all that burrito for $6.75 plus tax. I am ashamed to report that I ordered a massive barbacoa burrito and ate the whole thing in about 12 minutes. I’m not proud, but it is what it is. Because life does not let one escape without consequences (at least not this one) I felt like I was going to die immediately afterwards and my recuperation took double the time burrito consumption took. However, I am happy to say it’s out of my system and I probably won’t be craving Chipotle for at least a year. Lesson learned: Never start a walk when you’re hungry because it will end badly. 20 minutes later I was finally able to (slowly) leave my seat and, with two hours to go until my writing club meeting, I decided to head over to Arlington Central Library where I am right now. For those of you who haven’t had the pleasure to visit Arlington Central library, I highly recommend it. It feels more like a college library than a community library and is spacious, well-lit and relatively large with a very diverse group of patrons. All in all, a pleasant and quiet (but not overly quiet) place to spend a late afternoon. So life is good right now. A few, manageable responsibilities and obligations, lots of free time and plenty of time to think about what I want to do with my life — and even better — enough time to actually work towards some of those goals.